Falls among seniors are incredibly common, and can cause serious injuries. According to the Centers for Disease Control and Prevention (CDC), some 2.5 million adults aged 65 and older in the United States are treated for fall injuries every year. Each year, three million older adults go to the ER for injuries due to falls. And in a 2015 Caring.com survey of 2,000 adults, the more than 500 respondents with a parent or grandparent living alone or with a spouse said they were concerned for those aging relatives’ safety. Falls can have serious consequences for the elderly. They can cause injuries such as broken wrists, arms, ankles, or hips, and are a leading cause of head trauma. At least 300,000 older adults go to the hospital each year for hip fractures – most of which are due to falling, according to the CDC, and the majority of which will not health well if at all. In 2015, falls cost more than $50 billion, most of which is paid out through Medicare and Medicaid. Even if your aging parent falls with no injury, they (and you) may become more afraid of falls – which can lead to a decrease in necessary activities such as walking, exercising, and going out with friends and family. This decrease in activity can actually lead to muscle weakness – and increase fall risk. To help you protect your elderly loved ones from these effects, we’ve put together a helpful guide to help you understand how and why older adults fall, how to prevent falls and what to do after a fall. Many people have a combination of these risk factors which can lead to falling. Unfortunately, injury from a fall can lead to a cascade of events which reduce an older adults independence. The majority of hip fractures in older adults do not heal, according to the American Academy of Orthopaedic Surgeons, and can lead to a move to a residential facility. Prevention of falls, and thorough care after a fall, can help aging loved ones maintain their independence longer. Fear of a fall can lead to a separate set of challenges. Once your aging parent becomes afraid of a fall, she may avoid many situations that seem dangerous. She may cut back on exercise, socializing, or leaving the house. Although these actions may seem like the safest choices, they can make your loved one weaker so that a fall becomes even more dangerous. While the risk of suffering a fall increases with age, that doesn’t mean it’s unavoidable. In fact, there are a number of lifestyle changes older adults can make to lower the risk of a potentially life-altering spill. Your aging loved one should be engaged in regular, daily exercise that is appropriate for their physical condition. Exercise helps to build muscle strength and can improve flexibility. Aim for a mix of aerobic activity, such as walking, and weight-bearing activities, to keep muscles conditioned. Learn more about chair-based activities, water-based activities, and group fitness activities that not only strengthen the body but keep individuals socially connected. Many older adults find their appetite decreasing, and they become underweight. Losing too much weight puts their bones at risk. Smoking cigarettes is correlated with losing bone mass more rapidly. Encourage your aging parent to protect their bones strong by giving up cigarettes. Make sure your loved one is eating a healthy, varied diet and getting plenty of vitamin D and calcium. Talk to his doctor about whether he needs supplements to bolster bone health. Dehydration can make older adults weak and dizzy. Provide plenty of fluids in beverages, soups, fruits, and treats such as popsicles. As people age, alcohol can have an even greater impact on blood alcohol levels than in the past. Research shows that the more alcohol older adults drink, the greater their risk for hip fractures. Drink minimally if at all, and make sure your aging parent is in a safe situation where she will not be at risk for falling. Your aging relative’s sleep needs change with age, but sleep deprivation always increases risk of falling. If your loved one is having difficulty getting the sleep he needs, talk to your doctor. 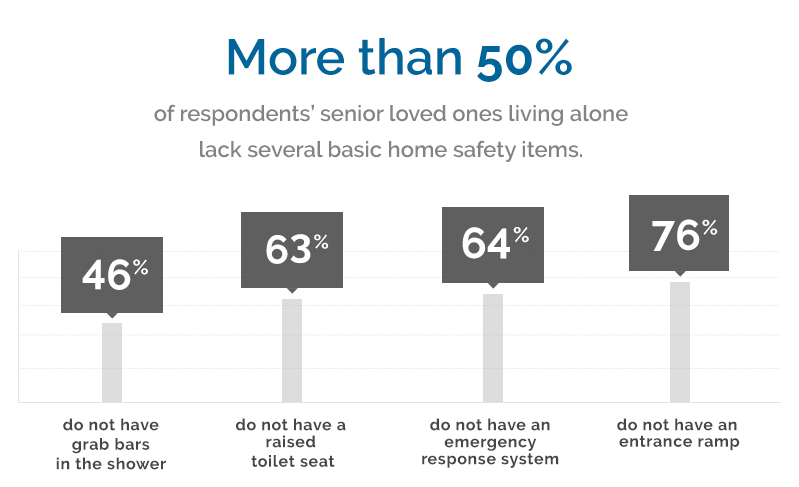 Despite their concerns, more than half of respondents to Caring.com’s 2015 Fall Prevention Survey said that their senior loved ones living alone lack a number of basic in-home safety items. Features such as raised toilet seats, entrance ramps and shower grab bars can help prevent unintentional falls, while emergency response systems make it easier for seniors to call for much-needed help in the event of a fall. Identify, with a doctor’s help, which risk factors for falls your loved one has, besides dementia (which is itself considered a risk factor). The list varies by individual, but for many people with dementia these include such common problems as poor eyesight, poor balance, arthritis, and generalized frailty. People with dementia may also have a shuffling gait, muscle weakness due to past stroke, or neurological problems. Review a complete medication list with the doctor, and ask which ones might cause increased confusion or worse balance in a person with dementia. Medications to especially look out for include drugs from a class known as anticholinergics, which includes drugs for overactive bladder, itching/allergy, vertigo, nausea and certain drugs for nerve pain or depression. Diphenhydramine, or Benadryl, is a commonly used anticholinergic that’s often included in over-the-counter sleep aids and PM-version painkillers. People with dementia are also more likely to fall when taking sedatives, tranquilizers, and antipsychotics. Finally, blood pressure medicines can sometimes work too well and cause blood pressure to fall when a person stands. These tests help determine physical risk factors. 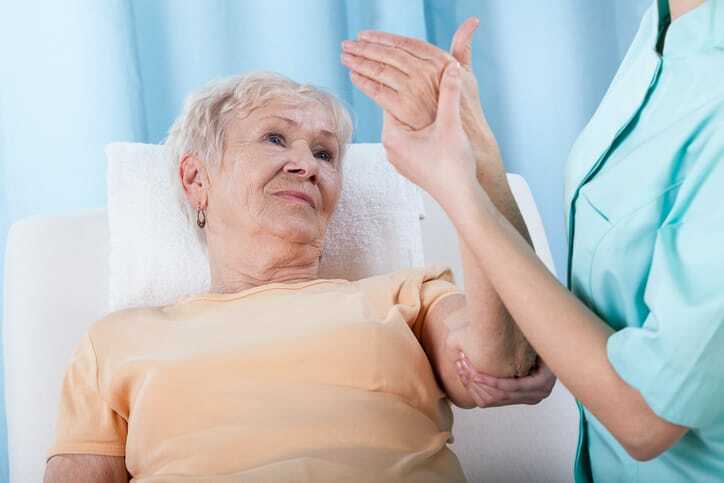 A doctor (or a physical therapist, to whom you may be referred for testing) will watch whether your loved one uses both hands to rise from a chair, for example, which indicates muscle weakness. Many (but not all) older adults are deficient in vitamin D. Studies have found that treating vitamin D deficiency does reduce the chance of future falls. The doctor can help identify the right supplemental dose. Whether or not they also have dementia, adults with osteoporosis are more likely to suffer injuries if they do fall. Note: Both older men and older women can suffer from porous bone. But since osteoporosis is more common in women, all women over age 65 should be screened at least once. These experts can work with your loved one to develop exercises that shore up weak spots. They can also evaluate the use of a cane or walker to see if the device (as currently being used) is more help or hindrance. Because forgetting to use devices is a common problem with dementia, a therapist may suggest ways to get around this. Low vision is a huge risk factor for falls, and many vision problems come on gradually but steadily. Some, like cataracts, are easily treatable. Also be cautious with bifocal glasses; although they’re convenient, one study found increased falls when people wore bifocals compared to monofocals, possibly because bifocals can make it harder to gauge depth and steps properly. Trimmed nails help people walk more comfortably and therefore properly, yet this is an often-overlooked aspect of eldercare. A podiatrist can also check out other foot-pain issues that may be affecting gait and balance. Social workers and geriatric care managers routinely perform these. An expert comes to the person’s home and targets danger spots (including fall risks) and suggests easy improvements. This assessment can focus specifically on the needs of someone with dementia. 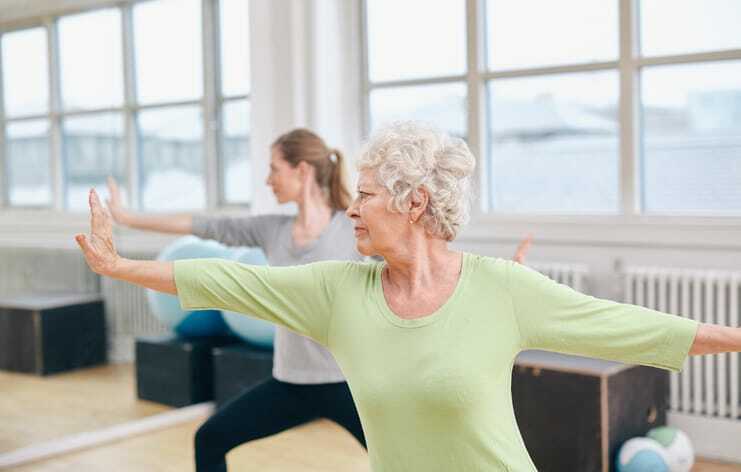 If your loved one is capable, consider an exercise class to improve strength and balance, such as tai chi or yoga for seniors. Even people with dementia can benefit. Bonus: It might be something you can do together, getting you out of the house. Discourage walking around in stocking feet, loose slippers, or flimsy open-heel styles. Overlooked footwear dangers include new shoes with smooth, unscuffed soles and walking shoes with heavy treads that “catch” on carpets. Scatter rugs are a top tripper, for example. In the bathroom, you can lay a towel or rug in front of the tub or shower when the person is exiting, if the floor is cold; then pick it up right away. Also tame unruly extension cords. Better than taping them to the floor is to remove them altogether. Remove piles of old newspapers and magazines and other clutter. Poor vision is a leading fall-maker. Watch for darkened hallways and stairs that might need more light. Replace burned-out bulbs. Don’t forget night lighting. Keep the night path to the bathroom lit. Consider using holiday lights, spaced nightlights, motion-detector lights, or simply leaving the hall or bathroom light on. These allow your loved one to catch him or herself in a fall. Regular towel bars are insufficient; they can be pulled off the wall if grabbed during a fall, often worsening the accident. For example, you might consider whether a pet could be limited to one area of the house, or let it wander freely only under supervision. Beware of chew toys and bones that get scattered on the floor, too. Children’s toys can be another hazard. Your aging parent has a number of options for medical ID and medical alert systems that could facilitate them getting help quickly after a fall. At the most basic level, an older adult may want to wear medical ID jewelry that provides first responders and others information about their medical condition, in the event of an emergency or loss of consciousness in public. A smartphone is an option in a pinch, however your aging parent might not have their smartphone with them when they fall or a fall might either break the phone or cause your loved one to be unable to use the phone. So you may want to consider other options that can either sense a fall or be as easy to use as pressing a button in the event of a fall. What is your budget? Each service offered by a medical alert system may have an added monthly fee. Do you want home monitoring or mobile monitoring, or both? If your aging parent needs a device to carry with them while they are out and about, that will be additional to home monitoring. However, an older adult who is homebound might not need a portable option. Do you need a system that works well for the hearing impaired? If your loved one has hearing impairments, make sure the system you need works well for those who do not hear well. Do you want 24-hour monitoring? This is particularly useful if you are concerned that your loved one may fall at night and will need an immediate response. Unmonitored systems are set up so that when your loved one signals that they need assistance, select friends and family will be called automatically to come to their aid. Do you want a fall-detection option? Medical alert systems may not automatically include fall sensing equipment. You might have to ask for – and pay for – this added option. Comparison shop to find the option that suits your aging loved one best. If possible, involve them so that they can let you know what device they will be most comfortable using. To help you in your search, visit our comprehensive guide to the Best Medical Alert Systems for Seniors. If your aging loved one lives independently, you also may want to check in with them daily – or ask friends, neighbors, postal workers, health aides, members of their faith community, or others who are in their neighborhood frequently to check on them regularly. If your loved one lives in a residential facility, talk to the facility managers about how they find out about falls that happen in their residents’ personal living areas. Your decision about what to do after an elderly loved one experiences a fall will depend on the situation. First, encourage your loved one not to try to get up immediately after a fall. It’s best to try to sit up slowly and possibly crawl to either a chair to pull themselves up, or to a phone to call for help. The person is having difficulty regaining consciousness. The person is in a lot of pain. Something about the nature of the fall warrants concern about spine or neck injury (for example, falling down the stairs or an inability to move). You notice signs of an acute medical problem that could have caused the fall, including chest pain, shortness of breath, or signs of stroke. Some falls don’t warrant an ambulance but require medical care because they may lead to complications if not treated. The person has hit his or her head. Older adults are at higher risk for bleeding between the brain and the skull after a head trauma. A CT scan of the head is therefore wise after any head injury. This is critical and requires immediate medical attention if there’s also a worsening headache, nausea, vomiting, or a change in mental status or neurological abilities. There’s been a cut that might require stitches or additional attention. A more minor abrasion can be treated the same way you’d treat one in a child: Wash it, apply antibiotic ointment, and cover the wound. The person reports significant pain in any bones or joints, which could be signs of fracture or bleeding in a joint. The person is no longer able to walk (but could before the fall). The person has less mental or physical function than before the fall (for example, is more confused than usual or has a reduced range of motion). You will likely need a medical evaluation after a fall. If a person is hurt in a fall, the first medical evaluation will probably focus on assessing the injury. Make sure a prompt follow-up appointment is scheduled to further evaluate the possible causes for the fall and to talk about how to prevent future falls. These evaluations may lead to some solutions that can help prevent future falls. 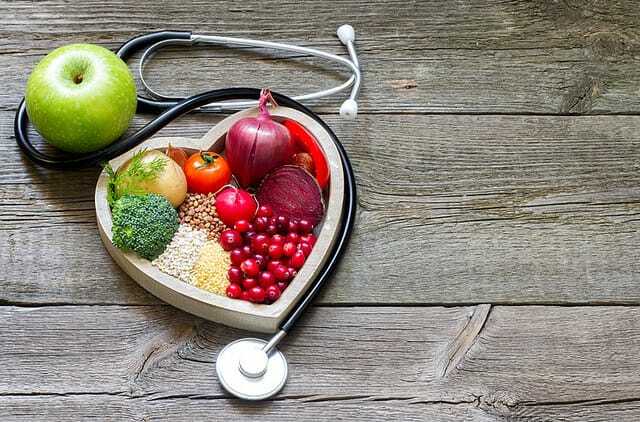 For example, treating illness, giving supplements to address a nutritional deficiency, or adjusting medication can help your aging parent be steadier on their feet. Some of these evaluations may require visiting more than one medical professional, such as an eye doctor or a podiatrist, or inviting a physical therapist into your home to help make your surroundings safer.